These were the four reassuringly confident words that Crown Regency Cebu Hotel Sky Experience Adventure general manager William “Bill” Killgore told us as we conquered our fear of heights at the Sky Walk Extreme. The platform where Sky walkers would step on looked intimidating, but Killgore immediately, well, killed any more morbid thoughts that could arise. Before we knew it, we were already in an orange jumpsuit and white sneakers being strapped to safety. The guides gave us a little briefing on safety and an added encouragement. Apparently, the deer-caught-in-the-headlights look in our faces had become embarrassingly evident. When we finally stepped out on the platform and began our walk, we were instantly seized with a little — just a little — sense of panic. Remember, you have someone here suffering from acrophobia. Our guides humored us during our first few steps and very efficiently distracted this moment of agitation by pointing out the breathtaking view that was set before us. Our jaws dropped at the magnificent scenery. We could see not just the whole of Cebu but even its neighboring islands and beyond. You want something as far as the eyes could see? The Crown Regency Cebu Sky Walk Extreme made sure ours did. We got too busy taking in the experience that we absolutely forgot about our fear. The adventure stroll turned out to be both comforting and exciting. The walk around the building took around 15 minutes to finish, and our stunts included sitting on the edge of the platform while our feet dangled in the air, dancing on the ledge (yes, ledge dancing to the highest level), and being dared to look 37 floors down. Who knew that walking would give such an adrenalin rush? Another kind of adrenalin rush was waiting in the form of the Edge Coaster. Found at the 38th floor directly above the Sky Walk, the interactive ride called Edge Coaster is the stuff man-on-the-street daredevils would instantly consider. It is the first ride of its kind in the world. “Just like the Sky Walk Extreme, the Edge Coaster is very safe. It was done by Interactive Rides Inc., known for building the safest and most extreme thrill rides in the world. Their most famous work is the Stratosphere in Las Vegas,” Killgore said. The ride is securely held together by double-redundant restraint systems. Think about it: the Edge Coaster moves around the edge of the building and tilts 55 degrees. Give it a try and feel like you’re hanging or in some instances, about to literally fall off your seat. Of course, the riders are provided with joysticks, so they could control the tilt level. 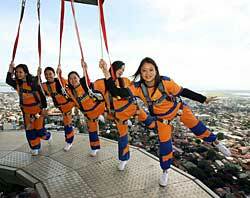 The rides at Crown Regency Cebu are not stopping with the Sky Walk Extreme and Edge Coaster. In 2010, the Insanity Orbit will take a bow. The Insanity Orbit, which is being installed at the 40th floor of the building, is an inverted centrifuge that will take passengers on a spin at up to three Gs. It will pull riders out in escape-proof seats to an angle of 70 degrees, tilting passengers face down from the top floor. The Insanity Orbit will be the second ride of its kind in the world, following the Stratosphere. “All this is our humble contribution to our tourism industry. We are proud to say that Cebu is the only spot in the world where you can find this kind of excitement,” King concluded.